It's over 3,000 miles from here to there. We'll be flying to our new destination in just one week. I can't believe it. Well, yes I can. Mm, no I can't. I don't know. This is all too much at once. We will be flying to North Carolina instead of our usual road trip. Thank God for corporate relocation. The only bummer is that I won't have my usual several days on the road to process the fact that I'm moving. Or talk radio. J. and I love our talk radio. I eeked out these luggage tags for E. and I during the last few days I had with my sewing machine before I had to pack it up. I don't want to suffer the same pick-it-up-put-it-back-down dance with everyone's luggage that I went through on my last trip. I made these solely as a decorative way to identify our luggage, but you can easily make this a "true" luggage tag with a piece of clear vinyl. Trace the pattern with water-soluble marker on the wrong side of your two fabrics and interfacing. Iron the wrong side of Fabric A to the shiny side of your interfacing. 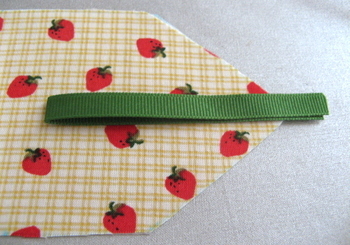 Fold your ribbon piece in half and place on top of Fabric A, with “loop” facing in. 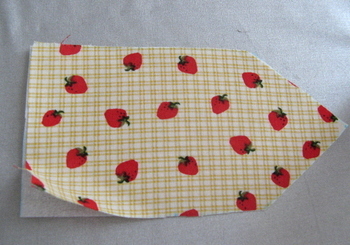 Right sides facing, layer Fabric B on top of Fabric A and ribbon. Press. Pin. 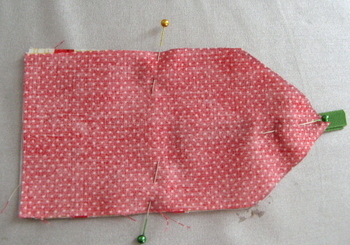 Sew a ¼” seam all around, leaving a 1 ½” gap for turning right side out. Clip corners. Turn right side out. Press. 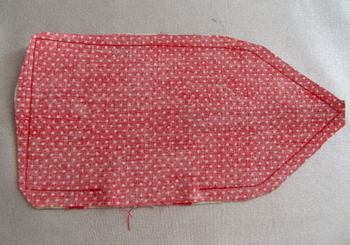 Sew a ¼” seam all the way around. (NOTE: if you would like to make this a "true" luggage tag, add a rectangular piece of clear vinyl to the top and topstitch around three sides of this vinyl layer). 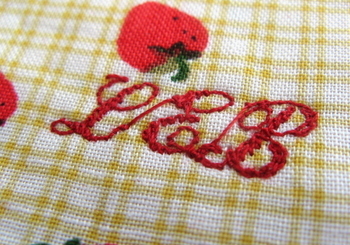 Try monogramming for added detail! I love your idea for luggage tags. Your definitely need a way to spot your black luggage from within the other ones. Thanks so much for sharing!! I love the tags and have decided to try and make some for a breast cancer fundraiser. Will keep you posted! Great stuff, thanks for sharing this tutorial. Hope you have a swell and safe trip. Question: at step 6, after you turn right side out and press, do you need to sew up the 1.5" opening, or did you just go ahead and sew the 1/4" around and that essentially closed it for you? My husband and I will be traveling to Alaska this christmas and I know the airports are going to be a mess and we definitely need something to make our bags stand out so I will be making a quite a few of these, and the will make great small gifts for our always traveling family. I wish I would have found you site before my cruise last week. I'm going on another cruise next month and you can bet these will be on my suitcase so I can spot them quicker. Also, I am going to put a circle of velcro at the end of the vinyl to keep the ID card inside in case it gets lost. Very cute tags. We need these to make our bags stand out when we head to Orlando next month. One suggestion: I would use a piece of vinyl that matched the size/shape of the rest of the fabric. After sewing it together I'd cut a slit in the vinyl on one end, slightly off-center (meaning not exactly ON the end). That way your paper or business card would stay put. Hope that made sense. Very very cute. And good luck with the move! 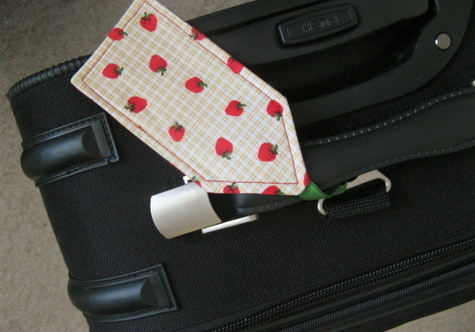 In response to Pixie's question: wrap the tag around your luggage handle and pull through the ribbon loop. Pull taut. This is the same way you use the paper tags they give you at the check-in counter at the airport. I hope that helps! if the ribbon is sewn in how does it hook around the luggage? Thanks! This is a great idea! I added the vinyl and made them a tad bigger (3" x 4" + triangle at the top) so that a business card fits in it. I have no blog so I can't post pix. But I'm having a blast making loud tags! This is a cool little project! I like it. Thanks for sharing this helpful idea. Love it! What kind of sewing machine do you use? I'm in the market for a new one, so I always like to know what others enjoy. Thanks for your great site! 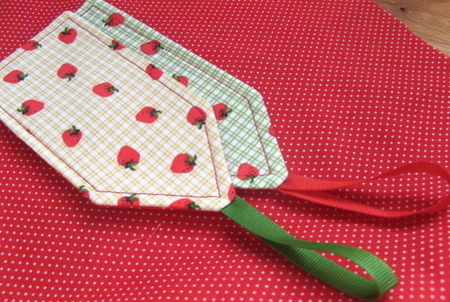 gorgeous and a pretty, practical solution! Cute as a button tags, and I sure could've used these myself this week when trying to find my bags in the sea of luggage at LAX! Hugs to each one of you! I am always amazed at the cute things I see when I peak at your blog. Good luck with the move and travel safely. I love your projects...many congratulations on your pregnancy and on your upcoming move! good luck!!! You travel so much you probably already know this, but don't check E.'s luggage if at all possible...the last time we flew they lost our boys luggage and what a nightmare...I learned my lesson! Good luck! Love the luggage tags! Great idea. Good Luck with the move, the tags are cute BTW. Very cute - I made some recently using vinyl. Probably should get pics up of that. Good luck with your move - hope it all goes smoothly!